Not all dogs know how to swim. They may not even know how to “doggie paddle.” Like any new situation for your dog, the key is to introduce swimming gradually. Start out by playing with your dog in a kiddie pool. Make sure your dog has fun with water. The next step is to bring your dog to a body of water, which is very different from a kiddie pool. Start out at a lake in a dog park, or a small river. Avoid the ocean until your dog is an experienced swimmer. The key is to find a shallow, warm, and calm body of water at first. Make sure your dog can stand comfortably with head above water. Usually, if you walk into the water, most dogs will follow instead of being left alone on shore. You can also use a leash to coax your dog, or give treats for each step into the water. 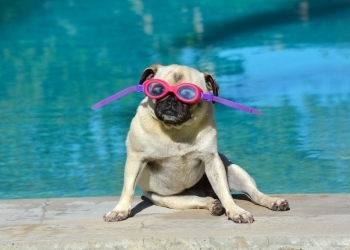 Don’t overwhelm your dog, so it may take a few trips before actual swimming. Eventually, as your dog gets more comfortable in the water, you can venture out deeper. While the dog’s instincts will be to start paddling in deep water, you may want to use a life jacket at first. Once your dog starts paddling, make sure your dog is using all four limbs to avoid fatigue. You can use an arm under the dog’s belly to provide support. If your dog starts to panic, return to shallow water and let your dog calm down. As you and your dog become more comfortable in the water, you can play fetch with a stick or tennis ball, or play with a variety of inflatable float toys designed just for dogs. Once your dog is an experienced swimmer, you may consider bringing your dog to the ocean, but there are additional safety precautions you should take. First, don’t let your dog drink the saltwater. That means keeping your dog well hydrated. Second, be careful of rip tides, and other natural hazards of swimming in the ocean. Be especially careful if you are playing fetch, and don’t throw the ball too far. Even the strongest swimmer, canine and human, can be caught off-guard while swimming in the ocean. Learn More: Pet insurance can help if your pet gets sick or injured by reimbursing on the veterinary bills. Some breeds, like retrievers and spaniels, will be naturals in the water. Other breeds like bulldogs and dachshunds don’t have body types for swimming, so they should always use a life jacket. The key to safe swimming, for dogs and humans alike, is to avoid fatigue and stay alert. Never let your dog swim unattended. Also, be careful of boats, other swimmers, unexpected currents, and any nearby fisherman. Depending on the body of water, and location, you should be aware of waterborne bacteria. Always rinse your dog after a swim, and be alert to any symptoms of ear infections which are common for canine swimmers because their ears have difficulty draining. Don’t forget that not every dog will enjoy swimming. Some dogs will simply be too scared to enjoy the water, even on a hot summer day. You want to make sure your dog is like Michael Phelps, and not Michael Yelps.